Owing to the efforts of our skilled professionals, we have been constantly engaged in offering a qualitative assortment of Decorative Marble Borders. 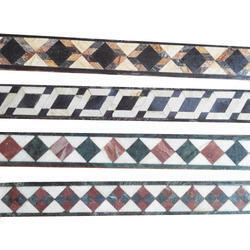 This Inlay Borders radiate a sparkling hue that will boost the beauty of your home. The natural look of our border adds charm and glorifies the home. A perfect combination of brown and white background along with intricate multi-colored designs perfectly features classy and contemporary style of today’s trends.